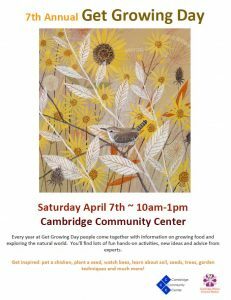 Visit the Cambridge Winter Farmers Market this Saturday, April 7th for the final winter market of the 2017-2018 season. In addition to typical market activities, this Saturday is also Get Growing Day, a kick-off for the upcoming growing season! At Get Growing Day you can swap seeds with other growers, learn about compost, or even pet a chicken! The Cambridge Winter Farmers Market is proud to be one of three Cambridge farmers markets to offer SNAP Match. All SNAP eligible purchases up to $15 will receive an additional $15 in matching funds. All fruit and vegetable purchases made by SNAP shoppers are also eligible to receive HIP benefits in addition to SNAP and SNAP Match benefits. The Cambridge Winter Farmers Market is open from 10am-2pm at the Cambridge Community Center, 5 Callender St. We hope to see you there!